LOWELL – Cecile Y. 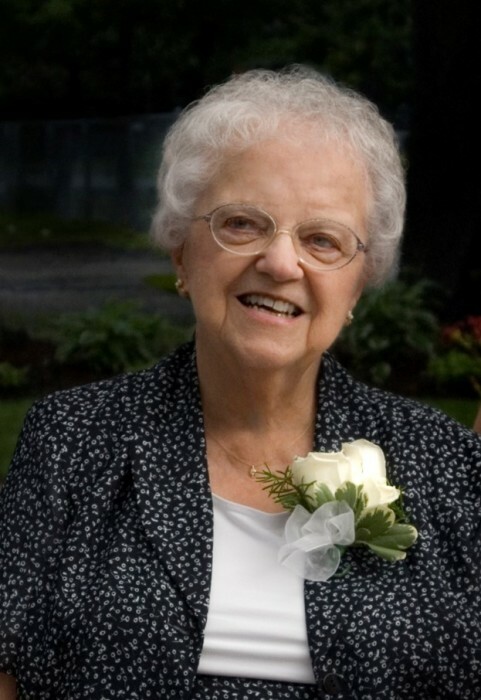 (Brouillard) Marchand, age 97, a longtime resident of the Pawtucketville section of Lowell, passed away on April 5, 2019, at D’Youville Senior Care, with her family by her side. She was the wife of the late Benoit H. Marchand. Born in Lowell on February 23, 1922, she was a daughter of the late Antonio and Lumina (Lussier) Brouillard. She was a graduate of Ste Jeanne d’Arc School and St. Joseph High School for Girls in Lowell and a parishioner of the former Ste Jeanne d’Arc Church. Cecile worked as a seamstress for many years in the Lowell Mills. She enjoyed quilting, playing cards and dominos and always loved having her family all together. She was a long-time member of the Cercle Jeanne-Mance. She is survived by five sons and two daughters in law, Gerard E. Marchand of Chelmsford, Henri B. and Nancy E. Marchand of Dracut, Andre B. and Gail Marchand of Londonderry, Rene J. Marchand of Lowell and Paul R. and Robin P Marchand of Pelham; three daughters and a son in law, Monique M. Letendre of Dracut, Louise M. Pepin and her friend Paul Paquette of Nashua and Anne Marie and Christopher Shemchuk of Lowell; fifteen grandchildren, Liane Weber, Daniel Letendre, Lisa King, Dianne Marchand, Nora Marchand, Adam Marchand, Joel Marchand, Christopher Preston, Caitlin Edwards, Amy Bedrick, Casey Marchand, Sunny Marchand, Bailey Marchand, Benjamin Shemchuk and Bethany Shemchuk; fourteen great grandchildren; a sister in law, Madeleine Ratte of Lowell; and many nieces and nephews. She was the sister of the late George Brouillard, Gerard Brouillard and Sr. Rita Brouillard and mother-in-law of the late Linda J. Marchand. MARCHAND – Mrs. Cecile Y. (Brouillard) Marchand. Relatives and friends will be received at the TYNGSBOROUGH FUNERAL HOME, 4 Cassaway Dr., Tyngsborough on Tuesday from 4 to 8 p.m. Funeral Wednesday morning with a funeral mass to be celebrated at 10 a.m. in the Parish of Saint Rita, 158 Mammoth Road, Lowell. Committal services will follow in St. Joseph Cemetery, Chelmsford. Memorial donations may be made to Ste Jeanne d’Arc School, 68 Dracut St., Lowell, MA 01854. For online condolences or directions, please visit www.tyngsboroughfuneralhome.com. Funeral Directors Roland W. Martin and Daniel R. Martin.